3rd layer = is green for life = ours in our new heart if we accept Him as our Lord. aww 🙂 this put a smile on my face. Really inspiring and wonderful for you to have done this. Cheers! ONce again my great intentions have gone bad. I wanted to do this so badly this year, but it’s not gonna happen. maybe next year …. or maybe easter. not his birthday but could still talk about it! This is such a GREAT idea! It is now on my Christmas Day menu. Thank you!! I have made this exact cake for years. Where did you find it? 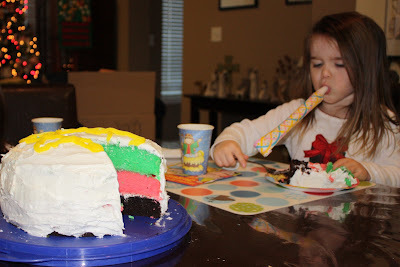 I have been looking for the original maker of this cake to give her credit on my blog!! Would love to know where you found it!!! Our family has been baking a little different 4-layer cake, each one representing the races of the world; that Christ was born for all of humanity. This will be our 50th year of baking 3 cakes and giving two away on Christmas eve. The four layers are red, yellow, chocolate and white. 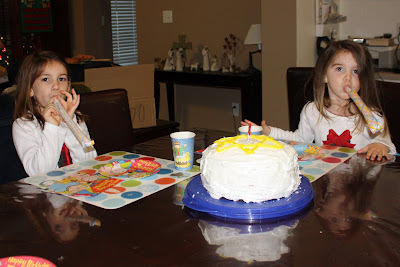 We use white frosting and sprinkle concentric rings of yellow, red and brown sprinkles on top. 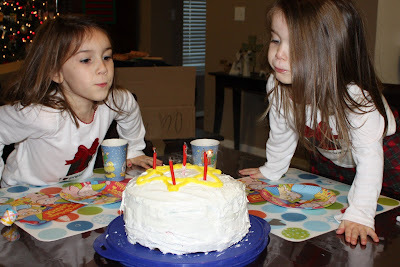 The white candle is given along with the story of the cake and our tradition. It is the one tradition that has lasted now 2 generations and we hope our kids will keep it going for many years. The original recipe was in a Buffalo, NY newspaper in 1961 and we have made the cake since 1962. We have never found the original recipe or article from the paper.